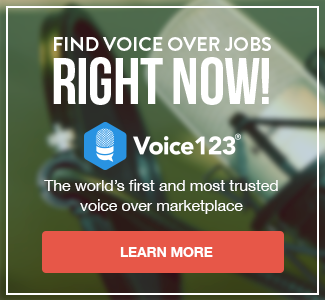 A voiceover agent is someone you hire to look for jobs that match your profile. Agents find you jobs, they are paid a percentage of your earnings when you deliver your work. If you don’t work, they don’t get paid. Many companies still work through agents and will not deal with you directly. Agents are certainly not hard to find—not in the US anyway; a simple Internet search will provide you with a string of hits you can investigate. An agent is a business partner that will work for you. Their job is to promote you as a voice-actor to potential clients and ultimately, find you opportunities to get gigs, or at the very least, audition. They may request complete exclusivity, which means you cannot have any other source of voiceover work unless they have secured it for you. Being represented by an agent does not guarantee you’ll get gigs, but they’re likely to have a good working relationship with major advertising agencies or production companies. Often, voice-actors who do not have representation won’t be able to work with these advertising agencies or production companies at all. Agents are a great source of high-quality jobs, but aren’t a panacea for your career. You need to be on multiple marketplaces and rosters to get opportunities from many sources. Combine that with direct marketing and you’ll get a good business going. The manner and reputation of your agent will definitely impact your career. They are the meeting-point between you and those who hire as well as ultimately pay you. They’ll coordinate schedules with clients, negotiate terms of service, address any specifics about the job, among other tasks. A good and recognized agent will get you auditions that match your style and type of voice. A not-so-good agent will send you to every conceivable audition call, without thinking whether you match the style the client is looking for. It’s worth keeping in mind that an agent also impacts your personal brand. Choose wisely. I think they’re fantastic sources of work, however, you need to be sure that the particular source you use is the most beneficial option for your voiceover career. For example, if you are contacted by an agent and asked to join their books don’t jump into their arms at the first opportunity. Be sure to read through their website, do your research and be sure that they are going to help you to excel within your specific field before signing any contract. Most specialized agencies are located in large cities, where there are more potential clients and a larger pool of talents. In the United Stated they usually charge a 10 to 20% commission, in other countries like Japan, they can charge up to 50%! Make sure you know what the fees are in your country. Most newbies tend to think that an agent is crucial to get work, but it ain’t necessarily so. While an agent assists in the process and makes it easier for you to be given opportunities, it’s your talent and skill that’ll get you the gigs. Never forget that. If you are looking for an agent, don’t feel you’re at a disadvantage in any way at all; you are the talent and you have the last word. Make sure you feel comfortable with their connections, business rules, enthusiasm and eagerness to be working with you. If you don’t feel an affinity, keep looking for the agency/agent that suits both you and your needs better. When you find one, ensure that you understand and fully agree to the contract terms. They shouldn’t be 100% exclusive; never have yourself imprisoned in an ivory tower. In today’s digital age, voiceover work can come from numerous sources. As an example, try to reserve your right to work with online clients. Keep as many options open as you can.